Join us at The Verona Vineyards "Speakeasy” for a night of Wine, Beer, Bourbon, Music, Food and Fun as we celebrate the 85th anniversary of the repeal of Prohibition. Try your luck at our Roulette, Blackjack and Texas Hold'em tables provided by Cincinnati Circus! Each table will be ran by professional dealers who also possess some entertaining talents! Tickets are now available! 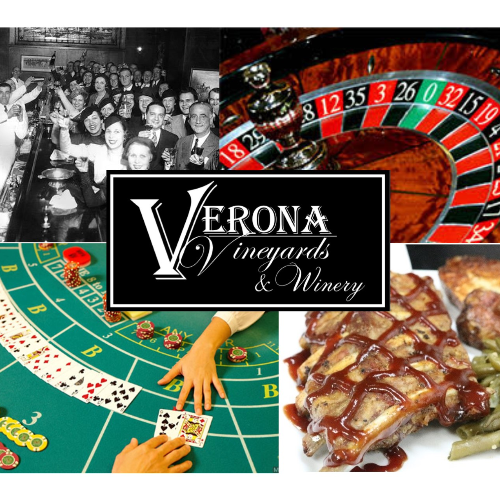 Included in your cost will be a glass of a Verona Vineyards award winning wine as well as $50,000 in gambling chips! At the end of your night every $10,000 earned will be traded in for one raffle ticket (limit of 25) that can be used to bid on multiple prizes provided by Verona Vineyards. Join us on a trip back to the 1920's and enjoy everything the "Roaring" era had to offer!